Our combined Nov/Dec meeting is set for next Tuesday, 04Dec. This will be an afternoon meeting, starting at 1pm with refreshments, library and shopping (an advantage to the afternoon meeting!). At 1:30, we’ll have some brief announcements and time for show and tell. 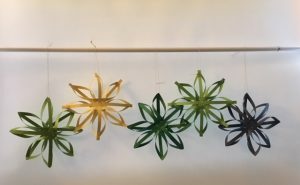 Our program this month will be hands on, making star ornaments made out of woven paper strips for holiday decorations. Member Joan Paul will lead this project. Joan would like a headcount, so she knows how many supplies to bring. Please email her if you plan to attend. Looking forward to seeing everyone next Tuesday afternoon!